One of the best-kept secrets of successful fishing is bait selection. 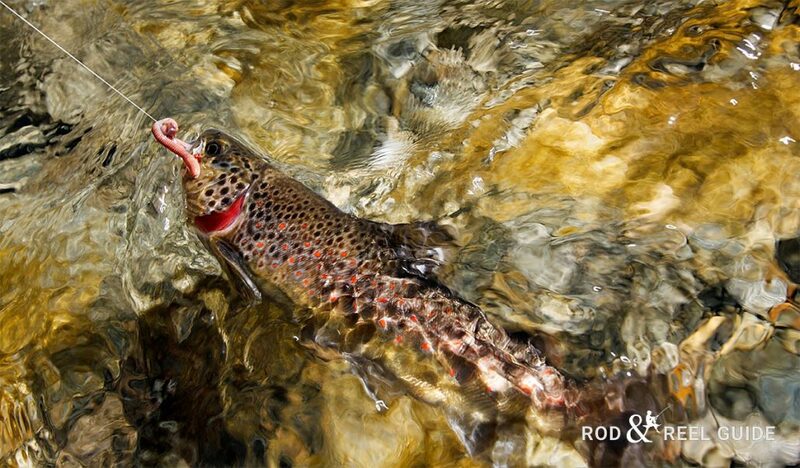 You could fish all day and catch nothing if you are using the wrong bait in a swim. There is such a huge variety of baits available to you today that it’s a bit hard – especially when you are starting out, to know where to start. Understanding the feeding habits of your target species and the most effective bait to use on that particular species is half the battle. Processed baits like cheese, bread, meat and biscuits, potatoes and carrots, peas, seeds, pasta and grains and High Protein baits like boilies for Carp. One of the best things about fishing with natural baits is you are targeting various species of fish with the food they actually eat all the time. Earthworms, for example, are deadly on almost all freshwater fish and are easy to get your hands on – just dig them up out of the ground. 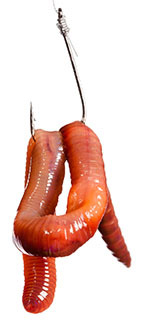 Earthworms, for example, are deadly on almost all freshwater fish and are easy to get your hands on – just dig them up out of the ground. 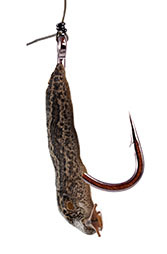 Slugs can be found in any vegetation and the best time to go on the hunt is the night before a fishing trip. If you grow any vegetables in your garden you can be sure there are slugs about as they keep eating them on you!! Attaching worms to the hook. 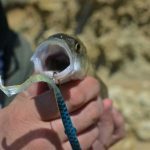 Normally when I first enter a swim I double hook the worm to keep it in place – especially if the fish are a bit picky and just nibble at your bait. This method helps keep the worm in place during casting but also prevents the fish sucking the worm off the hook and getting away. Once the fish get a bit more confident you can single hook the worms as the fish will take them whole and you get a solid hook up anyway. Attaching slugs to the hook. I like to use a bigger hook like a size 2 or 4 when fishing with slugs because you can target carp, tench and chub with this natural bait. you need a bigger hook to cope with these strong fish. Another advantage of using slugs is they are quite tough and you can often catch more than one fish with the same piece of bait. Their added weight help you cast the line out farther, especially if you are fishing light tackle in delicate waters where a big sinker is not an option. 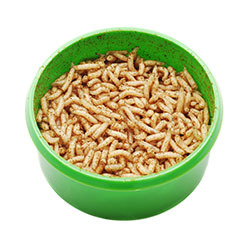 The most readily available maggots are Bluebottle larvae and can be found in any decent fishing tackle shop. You have a choice of colours and we find the best ones to use are dyed pink and mixed with normal white maggots. These prove especially effective in pressured waters that get fished all the time. Just check you local fishing rules to make sure maggots are allowed in the swim – especially in good trout waters. The most effective way to hook a maggot is by just barely hooking it through the blunt end as lightly as you can get away with. devastating bites from fish once they see them. 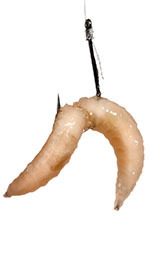 The best technique for using maggots in freshwater is to single hook them with size 16 or 18 hooks. I sometimes like to bunch them up on a size 12 if there are bigger fish on the bite. If you want to present the maggots in a more passive slow action then hook them through the body and they will sink horizontally, giving a more natural presentation.